IDEAL POUR LES FAMILLES ET COUPLES jusqu'à 7 personnes DES AMIS! Installé dans un bâtiment datant du 17ème siècle, a une entrée séparée, avec un bel escalier qui mène directement dans la salle à manger qui a des plafonds originaux et d'une cheminée dans le marbre du 17ème siècle. Cet appartement vous offre l'impression de vivre à Rome des siècles passés et retrace l'histoire et la vie de ceux qui l'ont vécue. Les deux fenêtres de la salle donnant sur la ruelle pittoresque ci-dessous. Élégamment meublées, Lily vous garantit un séjour inoubliable! Nous avons passé un excellent séjour, l'appartement est spacieux et très bien situé, proche des principaux sites à visiter, le trajet se fait facilement à pied. Le quartier est animé, nombreux restaurants et commerces. Bonne adresse a gardé pour une prochaine visite à Rome. Sophisticated yet comfortable, unbeatable location! A wonderful stay- a beautiful spacious home to return to every evening-with every comfort. 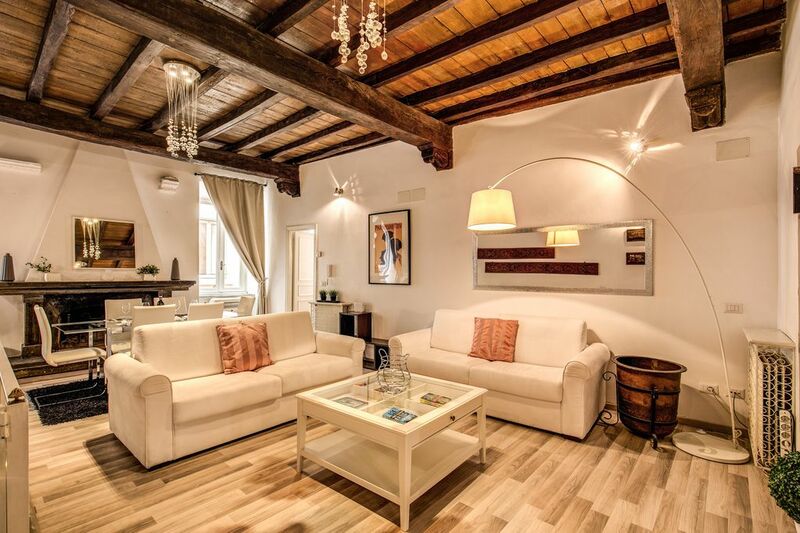 Steps away from Campo de Fiori, great restaurants, and walking distance to everything. The kitchen was fine for our needs, a new clothes washer, and good bathroom with shower. Beds were very comfortable. Great communication with our hosts. Would stay again! NO washer, barely AC. False listing and terrible stay. After reading recent reviews I contacted the owner regarding the AC issues and broken washing machine. There was no apology given regarding the AC challenges and only after asking what was going to be done regarding the broken washer I was given 10 euro and instructions to use the laundromat around the corner. The AC and washing machine need to be removed from the listing. The AC unit needs to be drained and water dumped (which was a mess) every 3 hours. If you don't do that the machine will beep - in the middle of the night and the AC cuts off. The 2 units are also located in the main living area - so the bedrooms get zero cooling. The windows in the bedrooms open to courtyards and get no breeze but plenty of cigarette smoke from the neighbors - we have allergies so that meant no open windows for us - plus the screens were FILTHY. the windows in the large front room did not have screens so unless you want all the bugs coming in you can't really open them. The furnishings are as shown although the white cotton sofas are looking quite dirty and there was a layer of grit on all the flooring. I would NOT recommend this unit to anyone unless they are traveling in the fall or winter. There is NO Washing Machine, - it looks as though it has been broken for years (likely never worked but it is in the unit) the AC is useless you enjoys emptying water trays every three house and plan to sleep in the living room. The location is great, we walked everywhere and only took 1 taxi to go to an area further away from the "main attractions". Overall this was our last stay in Italy and the one benefit is that we were all ready to leave because the apartment was terrible. Beautiful, spacious home within walking distance to so many sights! Beautiful home with a great room and adjoining kitchen. One bedroom was very large, the other large enough. Nice and clean and had everything we needed except a working washer/dryer. Adding the fans in the bedrooms was wonderful because the 2 portable a/c units could not cool the entire place. The drip pans needed to be emptied often, another downside. Otherwise, a great place to stay in Rome! My family and I stayed in this apartment for 5 nights from July 14-19, 2018. It was a very comfortable (beds were lovely), clean and quite apartment. Perfect location and walking distance from absolutely everything. Great bakery around the corner :-). The only thing that was a bit of a nuisance was the air conditioner units - they both accumulated a huge amount of water so we were for ever moping the floor and scooping water out of the pans. They did however warn us about this when we arrived. But otherwise a very functional apartment and we did not need to call on the owner once. Apartment was as expected as the description and photos are spot on. Very well decorated. Beds were really comfortable and the space was great for 4 people. Great location. Farmers Market and Grocery nearby. Great to have AC after walking around all day. 4 stars only due to Kitchen which was not as well equipped as it could be and awkward to work in. Washer and Dryer was not working which was a disappointment since we chose it back in March for the timing of needing to do laundry mid-way. But to be fair we think it may have gone out in the meantime and there was a laundromat nearby. Ce confortable appartement est situé dans une rue typique entre la Piazza Farnese merveilleuse, le site de la majestueuse ambassade française, et de l'animée et multiethnique Campo de 'Fiori, lieu de rencontre habituel pour les touristes et les habitants. Un marché se tient ici 6 jours par semaine jusqu'à ce que le pm 1 et 2 Ensuite, la place s'anime avec ses bars, clubs, et une scène animée sociale. Presque tout le centre a à offrir est une promenade de 20 minutes, mais ne vous inquiétez pas, la zone est bien desservie par les bus pour ceux qui préfèrent se la couler douce.